Is there any way I can use a Huinonn1060 Plus with Affintiy Photo? Are there special drivers required? Generic drivers? Temp work arounds? Welcome to the Serif Affinity Forums, Donald. Several users here appear to be using Huion 1060 Plus tablets successfully with the Affinity apps. What is your OS? I got one late last year - the drivers were supplied with it. It works well with AP though I had to uninstall / reinstall the drivers to get everything working. Since then it's been fine! there are no problems with that Huion graphics tablet. for all functions of the tablet to be able to use. Is there any way I can use a Huinonn1060 Plus with Affintiy Photo? Are there special drivers required? Generic drivers? The Huion 1060 Plus works with Affinity Photo. The one with 8192 pen pressure levels uses a different driver to the other two. You haven't stated what problem you're experiencing. In Affinity Photo 1.6.3.103 (Windows) Huion Drivers were causing a .net 4.7 EnablePointerSupport exception crash, which meant Affinity Photo would crash and close when you tried to access any menu items with the tablet plugged in. This was resolved in Affinity Photo 1.6.4.104 and an option was added to Edit > Preferences > User Interface > 'Enable Pointer Support' to prevent this from happening until Huion release updated drivers (This 'Enable Pointer Support' setting currently needs to be unticked to prevent crashing). 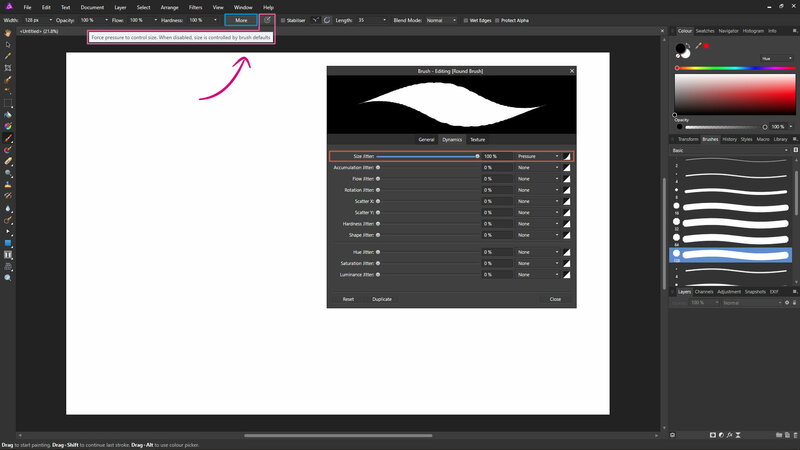 Alternatively, if your problem is that pen pressure doesn't appear to be working, then check that the brush you are using in Affinity Photo is one that's set to use pen pressure to control the brush size. Different brushes have different default settings depending on what they were created to draw like or mimic. Some are a constant size, some change size or opacity/flow depending on pen pressure, etc. The default basic round brush in Affinity Photo however is a constant size brush (I.E. It isn't set to use pen pressure for brush size control by default), which may be why you don't think the pen is working correctly. You can temporarily override this by clicking the 'Force Pressure to Control Size' button next to the 'More' button in the brush context bar at the top. This will override the brush's size jitter setting in brush dynamics and force pen pressure for brush size control. If your pen works with 'Force Pressure to Control Size' on, I'd turn it back off and go through all the different default Affinity Photo brushes in the brushes panel and see if you can find a brush that already draws like you want it to.